I could spend all day looking at Montessori baby spaces! They are truly lovely. And, turns out that looking at them is the prefect way to pass the time when I'm up nursing in the middle of the night. Here are 8 Montessori Baby Spaces to Swoon Over that I cannot stop looking at! Plus some really great Montessori Instagram accounts to follow! The light, the details, the floors! I love everything about this room! I also love that it incorporates some adult elements, because we all know how much newborns need their loving adult! I love the pull-up bar and the bright space! And the stars on the carpet! It just looks like a really fun place for an older baby. Isn't this the greatest floor bed? I love it's simple beauty and the pop of color. Plus that sheepskin rug is just so inviting! This room has some RIE influence and it looks awesome! This would have been Nora's climbing dream as a baby. I love the gross motor opportunities here. I love the floor bed solution here! That is the IKEA toddler bed without legs! And, how great the baby can get out and explore right away! This little play shelf is so beautifully organized. Just a perfect amount of toys made accessible to the baby! And, is that tiny crochet pink tower is killing me! This shared toddler-infant space is just so calm. From the art on the walls, to the shared table it looks like a wonderful place for siblings to hang out! Another wonderful shared space! I love that this is making the most of every inch of that room without being completely overwhelming for either of them, such wonderful inspiration! If you haven't already, you really should check out the amazing Montessori community on Instagram! There are so many great conversations and resources. 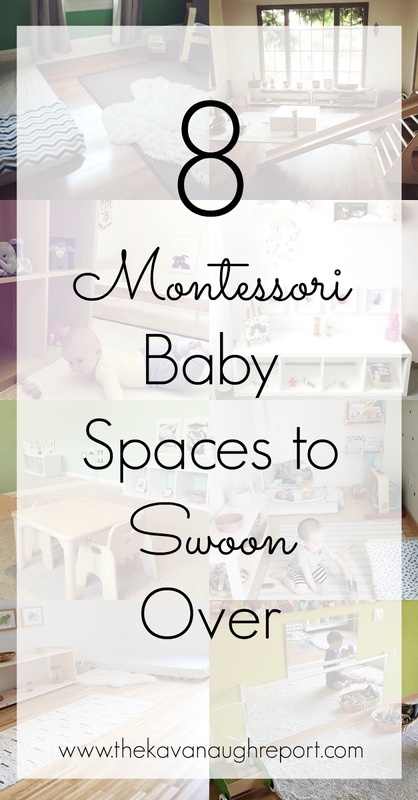 Do you love Montessori baby spaces as much as I do? Nowadays all parents want to develop the brain of their child with various ways. No child takes birth without brains, it means each child has different abilities, So parents should understand this thing in a great manner. I choose Montessori toys for my little daughter so I ordered it from "Kidadvance Montessori". They are quite different from the ordinary one. It is known since it gives a wide space to students learning without stepping out of their comfort zone.